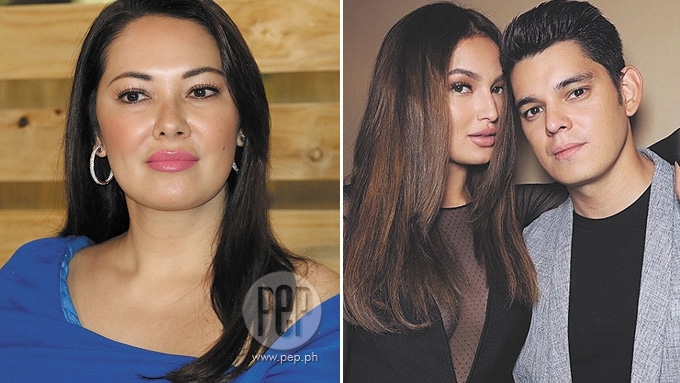 Ruffa Gutierrez's advice to her brother Richard and Sarah Lahbati: "I think yun ang pinakaimportante—they must communicate and always pray together." Aside from Sarah Lahbati's pregnancy, there are other reasons her wedding to Richard Gutierrez is not going to happen soon. Ruffa Gutierrez revealed to PEP.ph (Philippine Entertainment Portal) that her 33-year-old brother and his 23-year-old fiancée are more focused now on their respective careers, with Richard making the most of his showbiz comeback. She said, “I think right now hindi pa yata nila pinaplano kasi marami pa silang kontrata. “Especially Chard, he has just made a comeback, and it’s very successful with La Luna Sangre. The interview with the 43-year-old actress happened at her contract signing with the ALV Talent Circuit of Arnold Vegafria on Friday, September 15. NO REASON TO RUSH. Richard and Sarah have been together for five years, and their son Zion is four years old. He proposed to her on March 21, during their vacation in Switzerland. Ruffa said the couple is in no rush to get married. “Yung wedding, that’s so easy naman. They’re really together, it’s more of sealing the deal for formality. “I’m very excited for Sarah and to officially welcome her to the family. “But she’s also ten years younger than Chard, so marami rin siyang gustong gawin sa buhay niya. Ruffa married Turkish businessman Yilmaz Bektas in 2003 and separated in 2007. She admitted their split in 2012. They have two daughters, Lorin, 14, and Venice, 13. They both live with Ruffa. RUFFA’S ADVICE. Citing the lessons she learned from her broken marriage, Ruffa has these pieces of advice for her brother and her future sister-in-law. “Well, for me, the best advice is to keep love and keep God in the center of their lives. “Kasi once God is in the center of their lives, madali na ‘yon, e.
“Para lahat ng mga problema, maayos, at lahat mapagdaanan nila. “Kasi when you’re married, hindi naman it’s all honeymoon times, it’s not all good times. “What’s important is malampasan niyo yung bad times, and you have to be there for one another. “’Tsaka importante rin na hindi maging boring yung relationship. “You have to always do exciting things to keep it alive, kasi this is forever. “Hindi naman siya three years, four years, five years lang.